4 Wheels & 4 Helping Paws: Puppies thrown away like trash - can you help? 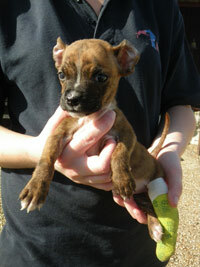 The RSPCA are looking for the person responsible for dumping two young dogs in a bin bag in Wiltshire. They were alerted after a member of public discovered the two brindle-coloured Staffordshire bull terrier-cross puppies in a black bin bag in an area of woodland in Wiltshire known as Bluebell woods. The area of woodland where the puppies were dumped is just past fields behind the village hall in Middle Winterslow, near Salisbury, and it is thought somebody in the small village may have witnessed someone acting suspiciously. The four or five week old puppies, which were found at around 4pm on Sunday, 9 October, were rushed to a local vet by their finder. Sadly, however the darker brindle pup was found to have ulcerated ruptured eyeballs and was put to sleep to prevent further suffering. The surviving lighter coloured male puppy has been named Piglet, he has an abscess on his back leg, which is currently being treated with medication and daily dressing changes. Piglet also appears to have chewed ear tips, a minor umbilical hernia and some fur loss, possibly as a result of mange. Piglet is being cared for by Wiltshire dog warden staff at Hillcrest Kennels in Coombe Bissett, near Salisbury, where he has already been offered a home by a member of staff. The RSPCA are very keen to trace the owner of these puppies and find out how they came to be found inside a bin bag in woodland. "It was very lucky that even one of the puppies survived, having been dumped so callously. The suffering of the puppy found with ruptured eyeballs does not even bare thinking about and his littermate was not in a much better state. I would urge anyone with any information about where these puppies came from or have information about them being abandoned to contact the RSPCA so we can ensure there are no other animals in the home being allowed to suffer." If you have any information that could help the RSPCA investigation please call their 24-hour cruelty line in confidence on 0300 1234 999.